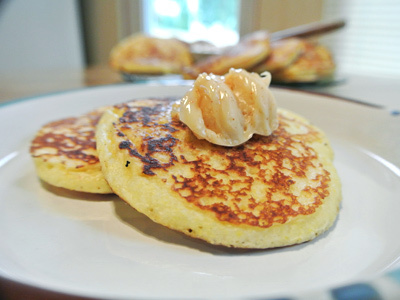 Fresh corn cakes are something of a summertime favorite. 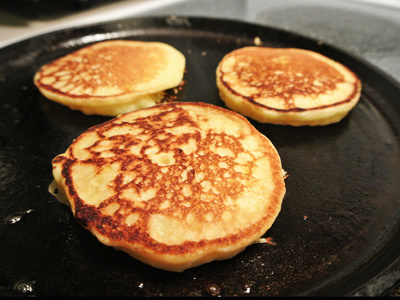 Corn cakes take me back to the farm when we would sit around the table with a pot of pinto beans and skillet cornbread. 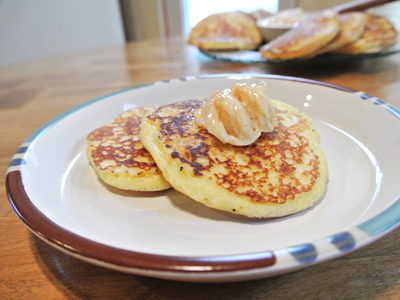 These corn cakes are made with fresh corn and paired with a honey butter spiked with cayenne. I took half the batter and added some diced roasted poblano which turned out great. We had fresh corn cakes alongside grilled veggies and sliced ripe tomatoes straight from the farmers market. It was so satisfying! You’ll need some cornmeal, flour, sugar, salt, baking powder, buttermilk, eggs, butter and about 3 ears of corn cut from the cob. And just because I happened to have a roasted poblano on hand, I’m going to add it to about half the mix. Cut the corn from the cob. It’s easier to use a deep bowl to catch all the flying kernels. 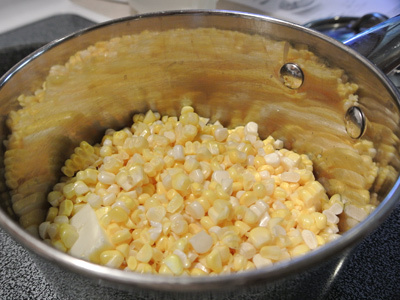 Heat the corn in a medium saucepan over medium heat with a tablespoon of butter. When the butter melts and the corn starts to sizzle, about 2 – 3 minutes, stir the corn, cover the pan and turn off the heat. Leave it over the warm burner for 5 minutes. The corn will steam a little and taste oh so good. While the corn is steaming, time to mix the dry ingredients. You’ll need 1 3/4 cups flour, 3/4 cup cornmeal, 2 tablespoons sugar, 1 tablespoon baking powder, 1 teaspoon salt. Mix it all together. 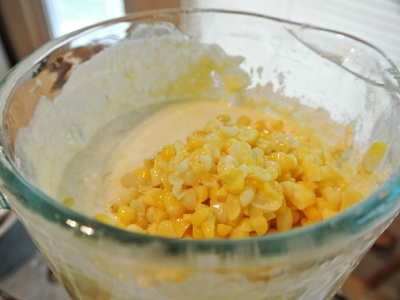 In a blender, mix about half the corn kernels and 1/2 cup of buttermilk. Puree the corn and milk. I used to mix up the remaining batter by hand, but I’ve since decided that it’s just as easy to mix everything in the blender. You just need to scrape the sides to get it flowing. 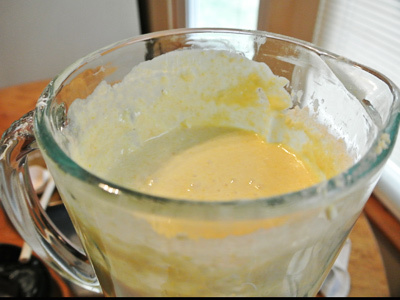 So keeping it in the blender, add part of the dry mix, the melted butter and half of the remaining buttermilk. If the blender begins to clog up just run your spatula along the inside of the bowl and stir slightly. Once you get it going, it just takes a few seconds to blend it all together. 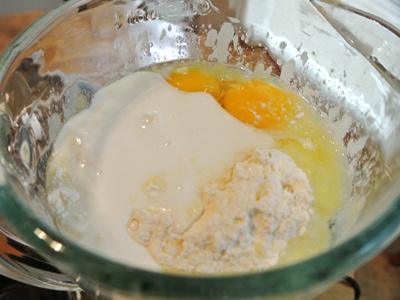 Now add your remaining dry mix, eggs and remaining buttermilk. The blender bowl is almost full at this point so hold on tight to the lid. 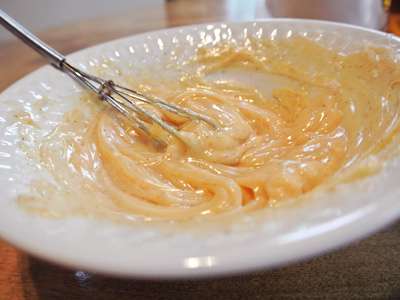 Blend until it’s all mixed up and you have a nice thick batter. Run your spatula along the inside edges and along the bottom to make sure all dry ingredients are blended in. Stir in the remaining half of the corn kernels and stir into the batter. A griddle or cast iron skillet works best. 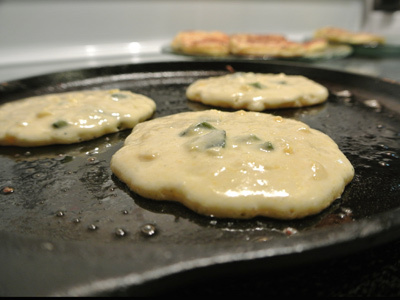 Heat the griddle on medium high and take a pat of butter to run along the griddle. All you need is just enough to coat the bottom. 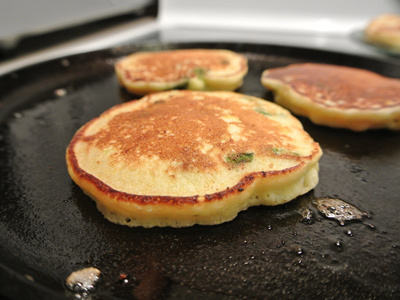 Add just a little sliver to the griddle before cooking the next batch of corn cakes. I scooped about 1/4 cup of batter for each corn cake onto the hot buttered griddle. In just a minute or two air bubbles will start to form. Lift the edge slightly if you are unsure when to flip to the other side. It should be crisp and browned. Those look just about right. Now let those cook another couple minutes. If they start to cook too quickly turn down the heat a little. You want the inside to cook throughout. After about half the batter, I added my diced poblano to the remaining batter and made some more. I think corn and chiles naturally go together and these were oh so good. I love to see the flecks of green showing through. Before I serve these up I’m going to make a tasty sweet chili butter made from softened unsalted butter, honey, cayenne pepper and a little salt . . . well, because my butter was unsalted. You can skip the salt if using salted butter. The butter needed a little help so I put it in the microwave for 15 seconds just to soften it enough that I could whip it up. 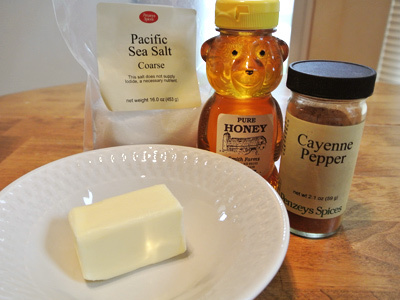 Next add 1/4 teaspoon Cayenne pepper, a pinch of salt and 2 tablespoons of honey. 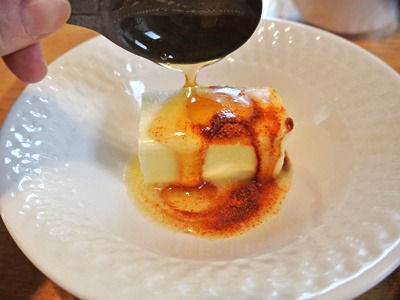 If you like it extra sweet add another tablespoon. These little mini whisks are great for whisking butter. If fairly sparkles with red cayenne crystals. One thing to keep in mind, if you make this up ahead of time and refrigerate it, the butter will harden so make sure to take it out and let sit room temperature for a few minutes to soften before patting on your corn cakes. This recipe makes approximately 24 corn cakes. If you have too many for one meal, like I usually do, place them in a plastic zip lock bag and refrigerate. These can be warmed up in the toaster oven in just a few minutes and taste just as good. I toast them up so I get that crunch on the outside edges. 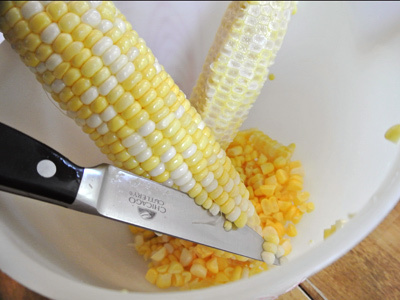 Cut corn kernels from cob and place in a medium saucepan over medium heat with a tablespoon of butter. Stir while the butter melts in the pan. Cook for 2 minutes, turn off the heat, cover and let sit over hot burner for 5 minutes. 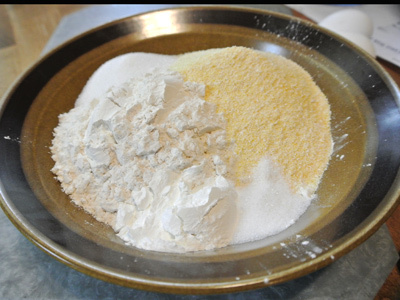 Combine dry ingredients of flour, cornmeal, sugar, baking powder, and salt. Mix together and set aside. 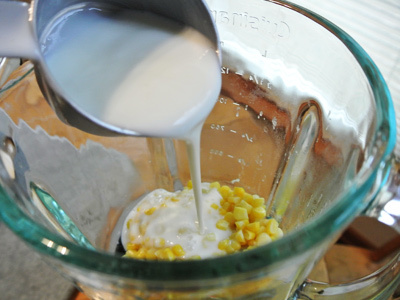 Using a blender, combine 1/2 of the corn kernels and 1/2 cup of the buttermilk. Puree until well blended. 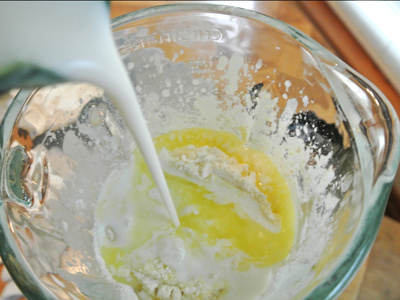 Add about half of the dry mixture, the melted butter and about half of the remaining buttermilk. Blend until well mixed, scraping the sides and bottom of the blender. 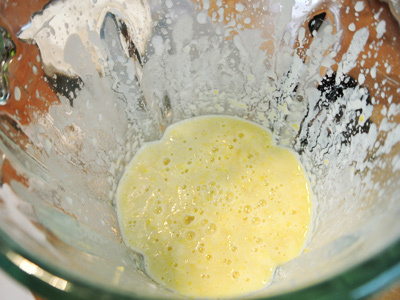 Add the remaining dry mix, eggs and buttermilk and blend again until you have a nice consistent batter. Note* If blender clogs, scrape the sides and bottom of blender and stir with a spatula to loosen the batter. Add the remaining corn kernels and diced poblano if desired to the batter and stir. 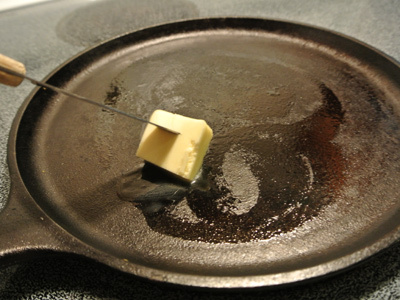 Butter a cast iron griddle or skillet over medium high heat. 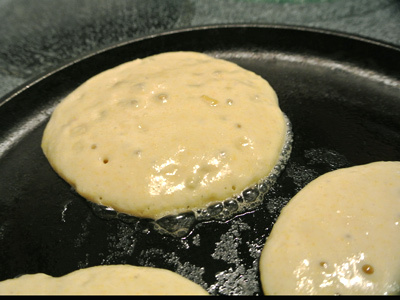 Pour 1/4 cup batter onto hot griddle. Cook 2 – 3 minutes on each side. Transfer to a warming plate while you cook these in batches. 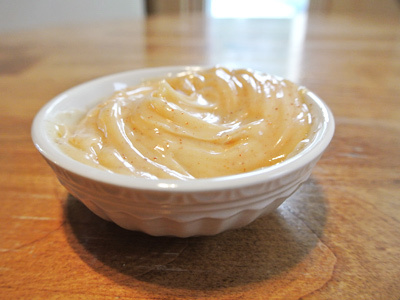 Whisk together softened butter, cayenne pepper and honey together in a small bowl. Add a pinch of salt if using unsalted butter. Note** Once butter has been refrigerated it will become hard. Set at room temperature a few minutes before serving. 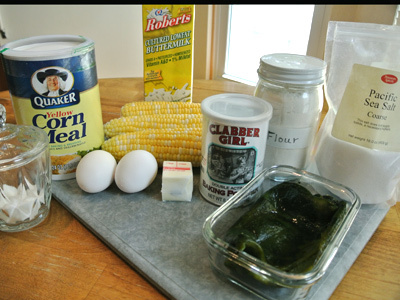 Nice recipe- we are growing poblanos and will give this a try (we are big corn cake fans). 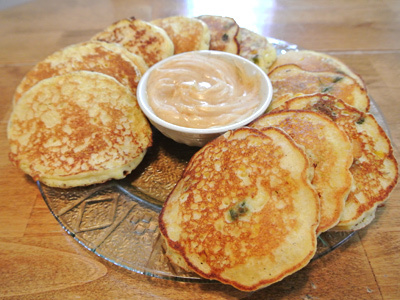 We love corn cakes too, but I would have to say my family went through the stack of cakes with poblano first.